Some people think that wearing skulls and leather, having tattoos, and drinking to excess makes them a ‘Rockstar,’ but you know where they’re wrong? They wouldn’t tell their boss they’re taking a mental health vacation and heading to the Amazon with little more than a month’s notice. That’s where the legitimate rockstar differs from the conflict diamond wearing latte toting stand-ins. The legitimate Rockstar flies by the seat of his or her pants and worries about the boss after they worry about their mental health. 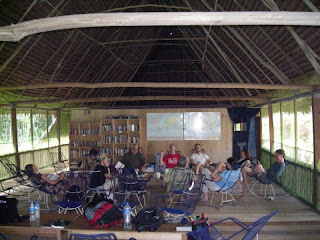 That said, most of us aren’t fearless (or stupid) enough to venture alone to the Amazon and stay with the local tribe. In this case, shamans, caimans, and the Jaguar people of the Peruvian Amazon. I recently heard about ayahuasqueros and their icaros (sacred medicine songs). I thought to myself… I must have suddenly grown up because even I couldn’t do that, but it tugged at me… this mild fascination with the art of ritual hallucination. In fact, it sounded so heady mind-fu@king exhilarating that I had to dive in and find out more for you. The jungle surrounding the Amazonian town of Iquitos, Peru. 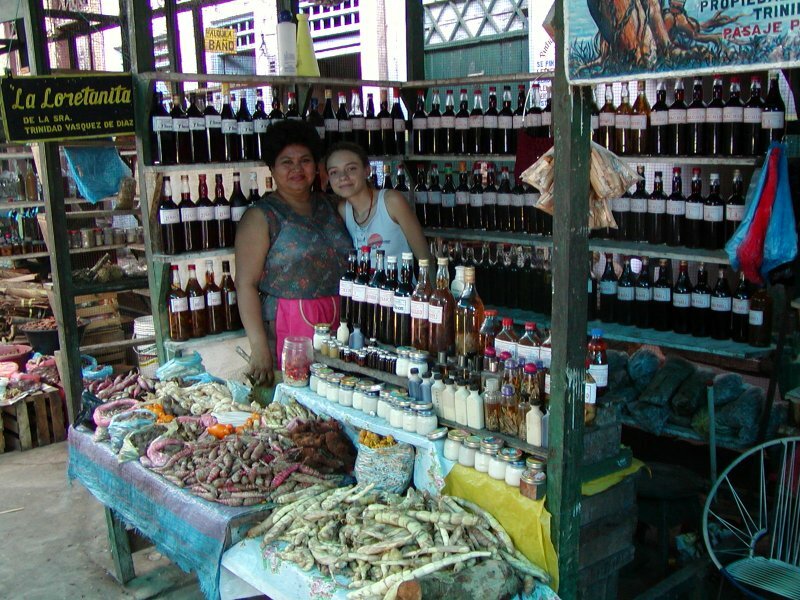 Blue Morpho, based in Iquitos, specializes in, can you dig it… Shamanistic Workshops! Sitting on 180 acres of privately-owned primary forest, it’s a perfect setting of serenity where you’ll go back in time and attempt to heal your wounds, expel bad vibe, and greet your inner child. Keep in mind, you have to be that uniquely brave sort of person willing to rough it in the jungle and drink a hallucinogenic plant to find yourself. You’ll vomit and gag… potentially lose your mind, but hey, that’s life, isn’t it? It’s perfect for the lover of yoga, meditation, & tabs of LSD in the college years sort who’s all grown up with at least a few hours of pent up issues in need of a good purge. The sacred plant spirit is supposed to remove the weight of your sadness and get rid of that heavy energy or hucha. 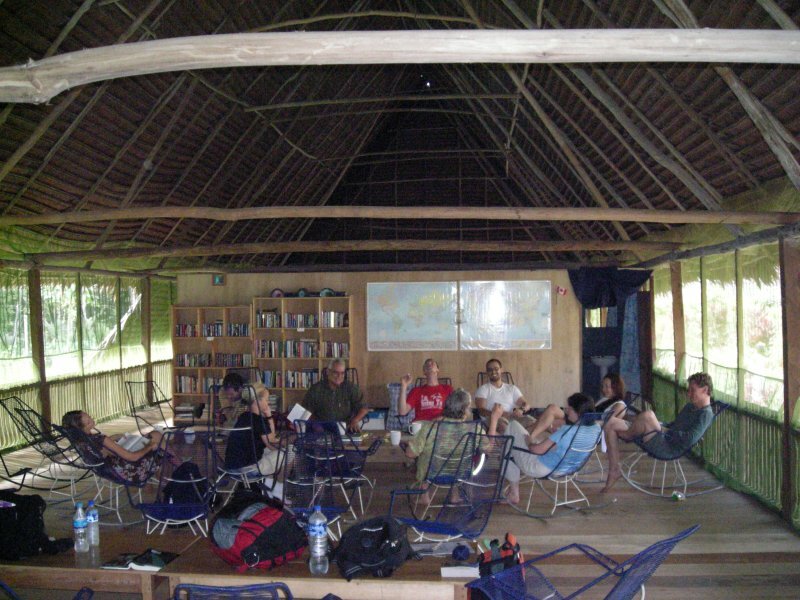 A group of Ayahuasca Adventurers. They say the songs of the Ayahuasqueros spontaneously come forth. These men of the jungle singing only what the plant tells them to sing, calling the plant to purge you from your past in order to find you again. Is this real Amazonian healing magic or just your imagination running wild as you drink from a trippy shrub? Hmmm… it’s certainly worth investigating. Just be cautious… and in a clear enough state of mind so you can handle whatever that glittery power plant sings to you. 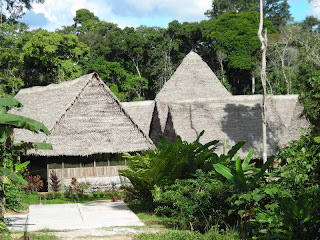 “9 Days Shamanic Workshop and Jungle Trip” begins on a Monday morning at 10:00 A.M where you’ll depart Iquitos at 11:00 A.M. to begin an hour and a half trip to the Shamanic Center, go on a Medicinal plant walk and finish with an optional Camalonga Dream Journey. The Camalonga Dream Journey requires an evening fast where you drink Camalonga, a sacred teacher plant that guides through dream journeys. 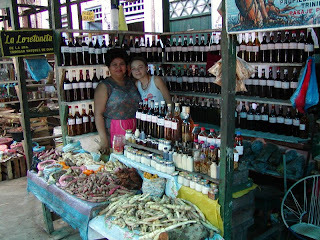 For those wanting to stay in the Amazonian town of Iquitos, another helpful site highlights the medicinal markets, Belen Street Market, Jaguar people, Things to do, Restaurants, Hotels and how to navigate around as a gringo or gringa-rette. Apparently, hotels are negotiable and relatively pricey due to the isolated location. Iquitos can only be reached by plane. The secret is to ignore any attempt by the taxi driver to bring you to a hotel that he recommends. If, however, you don’t want to find your content inner child or purge your demons, there’s always a more luxe way to go. An Amazonian river boat trek!! Yes, International Expeditions, the world leader in nature travel, just announced a $500 per person savings ($1,000 per couple) on its February 29, 2008 10-day Amazon Voyage. 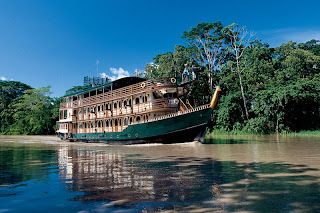 Guests on this departure will travel twice as deep into the Pacaya-Samiria Reserve with an extra night on the river, going deeper into the Amazon than any other outfitter. The per person price for the February 29 departure is $2,698 for lower deck cabins and $2,798 for upper deck cabins, including the savings. Prices include all accommodations, most meals, local transportation, guides, and group transfers. Airfare is additional, but can be booked by International Expeditions. FYI – Back in 1980, they supported conservation projects across the globe before the word “ecotourism” was even coined, bringing some of the first leisure travelers to the heart of Peru’s Upper Amazon. 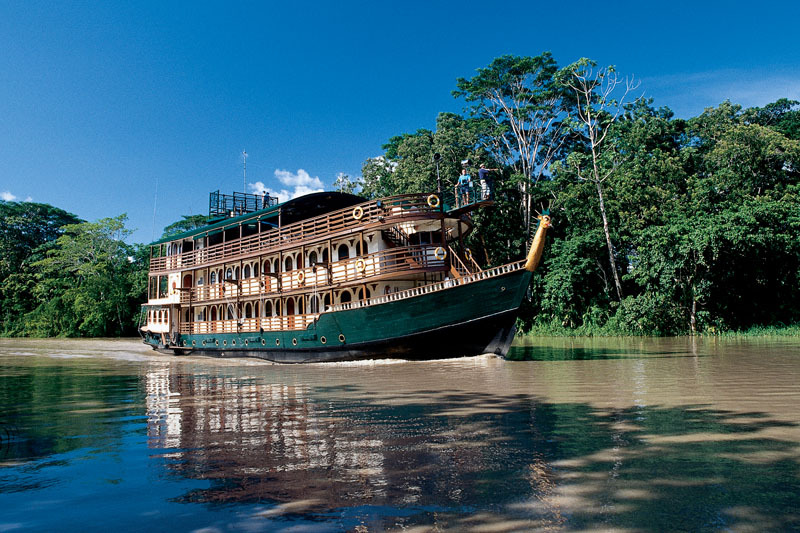 Today guests explore the Peruvian wilds in comfortable style aboard an intimate 28-person riverboat (talk about Agatha Christie fun and mayhem). It’s specifically designed to sail the upper Amazon Basin, considered the most diverse ecosystem on Earth. You’ll witness the awesome panorama of a rainforest filled with more than 100 kinds of birds, pink Amazon River dolphins, eight species of monkeys, sloths, giant otters, and nocturnal animals such as caimans and capybaras. Throughout the journey, highly trained guides lecture on the complex environment in constant need of preservation. Man, I love wildlife (and highly trained Amazon river guides). In addition to explorations on small excursion boats for access further into the heart of the vast wetlands, you have the opportunity to visit small villages and get a glimpse into real life along the river. In case you’re not ready to purge your hucha with Shamans, of course. You can visit local schools, hand out donated supplies to children, and even assist with community projects. International Expeditions is a pioneer of environmentally responsible travel, committed to preserving natural habitats and improving the welfare of the people and communities it visits. So take your pick. Either way, I’ll think you’re Rockstar.